Land Hunters! Show Us Your Dirt Gold. Dug From The Soil! The underwater and beach detectorists post some awesome gold finds! I'm a land hunter. Land gold is so hard to come by. Have to dig lots and lots of garbage. I've found 2 gold rings in a year and a half of searching. Post your dirty gold finds. I'd love to see them! Here are the 2 I've dug. Those are some really nice gold finds there! I've only found like 3 gold items since I got back into detecting 1.5 years ago. My first was a squished 14k lady's snake ring. The second was a chunky 7.5g men's wedding band that I was able to return to the owner. 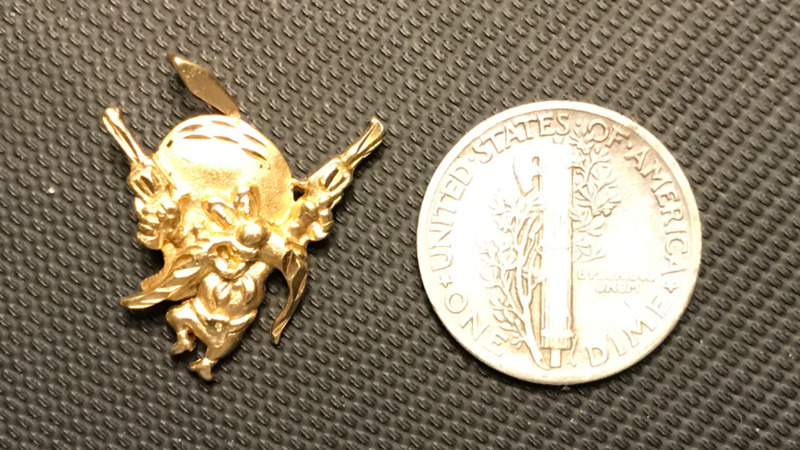 The third was a tiny 14k Yosemite Sam pendant. This is the only gold I have found and kept. 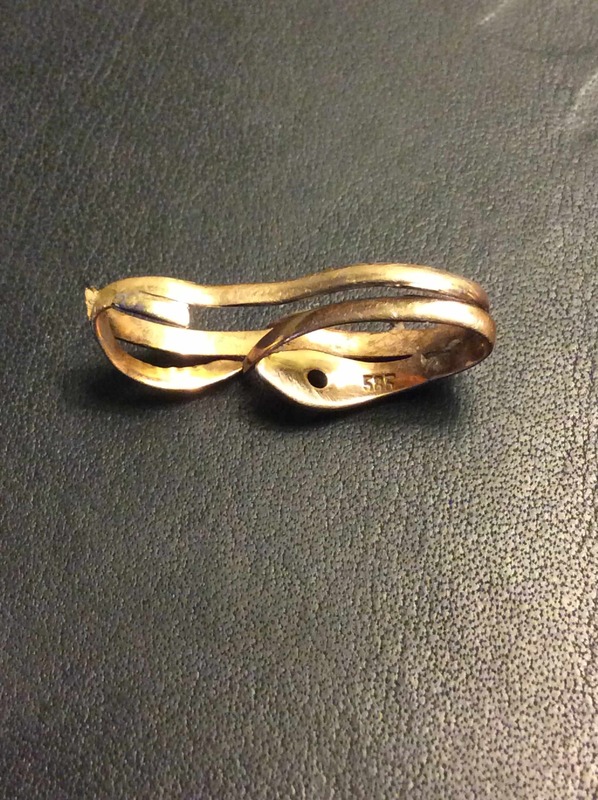 I have also found and returned a certain property owners wedding ring 4 times. Whenever I am txt a picture of a ringless finger I know to head that direction. I've found 3 or 4 total in 7 years... Ill see if I cant find old photos, but one was just the other day good thread idea! 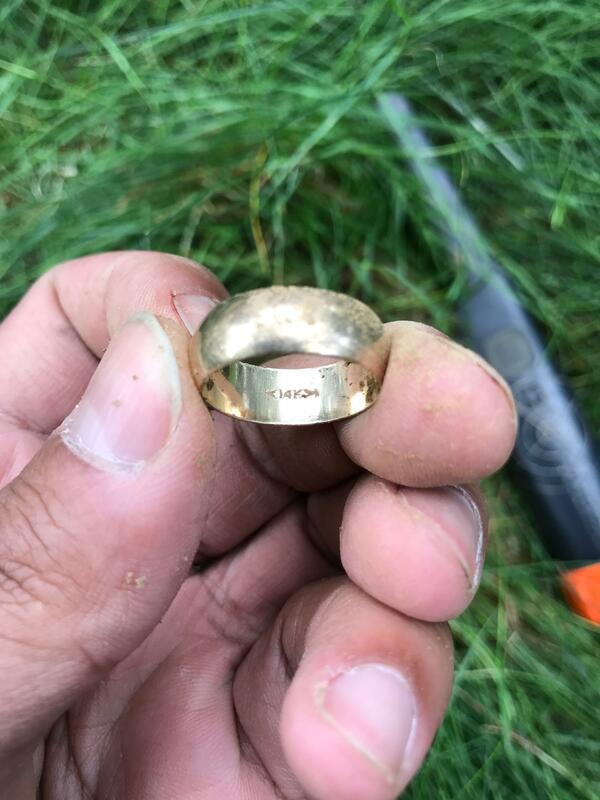 I don’t find much gold,but did hit this 9 gram wedding ring last fall in a yard. Only at this since December last year but feel I have been fortunate. Some rings and a 14k money clip. Found lots in the water, not much on land. Here's a few pics of a couple pieces I saved from land. Still have the old brooch. The huge LofL ring was Chevrolet League of Legends 20 Years and every 5 years of being number 1 sales they would apparently take the ring back and put a bigger better diamond in it for you. This one was 3/4 carat, VS2 brilliant cut that appraised for $3300 just for the diamond (now sits in my wife's wedding ring). The fob was 14k Masonic keystone, unfortunately the chain and rest of the watch was not in the hole with it. Awesome ring. Did the owner mention how old that wedding band was? It has an identical styled 14k hallmark as mine. 2 kind of arrows on each side of the 14k. Not sure if there is a way to date mine based on the hallmark. Nice finds, everyone! 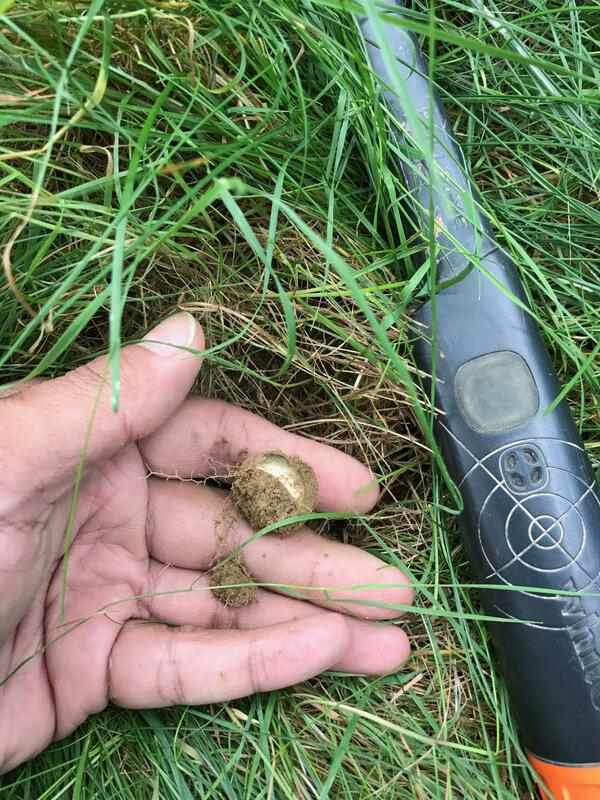 I am super jealous – I've been detecting for two years and have yet to find any gold. Have found a lot of great history and a good bit of silver, but still waiting on gold. Here was my last gold I have found in about a year. This was in Arizona last year. Cool thread. I was fortunate enough to find 13 gold items in my 2 years of hunting, all in the dirt at local parks. I don't think all of them are included in these pics, but it was fun seeing them again. Stiffwrists, I have only found silver/gold hybrids in 2018 ( ), but have 10 pieces of gold from March 2015 to October 2017; 3-10K, 5-14K, 1 each 18K and .9999. Included is one diamond and one ruby. I had to borrow a bunch back from the wife to get this picture. I was going to say that the hallmarks looked about the same! The wedding date inside of the ring was 1974. So not crazy old. Here's mine from 2 years and 2 months of detecting. Not shown are two 10k class rings that I returned.